If you enjoy winter sports but are on a tight budget, come to the Scandinavian countries in January. The holidays are over and things start to calm down again. For travelers, this means lower prices, less tourism, and fewer crowds. Travel prices are among the lowest of the entire year right now. In addition, January is perfect to visit the winter sports destinations that Scandinavia is so famous for if you are an outdoorsy person. Remember the 1994 Winter Olympics in Lillehammer, Norway? Norway is a mecca for winter sports enthusiasts and offers something for every taste. This is the perfect time of the year for winter sports such as skiing, snowboarding, or sledding in Scandinavia. Have fun in the snow! Additionally, the most amazing natural phenomena, the Polar Night, can be witnessed in the northern parts of Scandinavia in January, especially in Norway and Sweden. January sure can be a cold month! 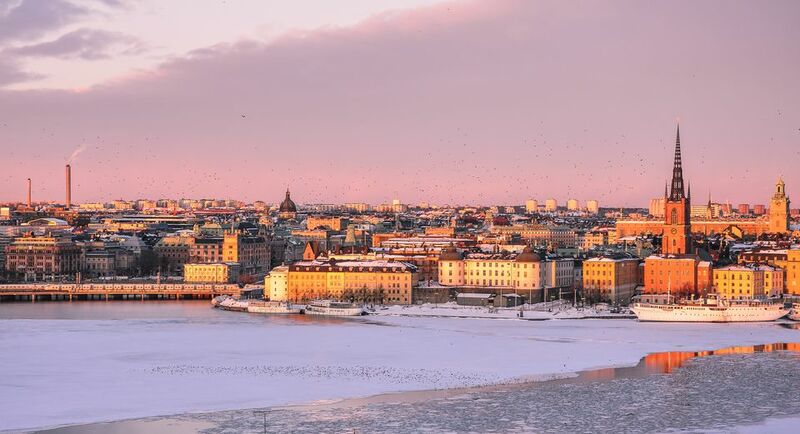 But as in many places around the world, it very much depends on what exactly your destination is and temperatures can vary a lot across different places in the Scandinavian countries. Going further north across Norway and Sweden, it is normal to experience 22 to 34 degrees Fahrenheit (-5 degrees to 1 degree Celsius). This is where you will find lots of snow. Nights in Sweden's far north can easily drop as low as 14 degrees Fahrenheit (-10 degrees Celsius). There won't be much snow in Denmark, as the weather is too mild and humid, and the sea surrounds the country, discouraging snow conditions from forming over Denmark. During this winter month, Scandinavia gets 6 to 7 hours of daylight, but if you go far enough to the north, including northern Sweden, this number can decrease rapidly. In certain areas of the Arctic Circle, where is no sun at all for a period of time, this phenomenon is called a Polar Night (the opposite of the Midnight Sun). During many winter nights, you can view the amazing Northern Lights. Are you headed to the Arctic Circle? Bring sturdy boots for walking on the snow and ice, a down-filled waterproof outfit, hat, gloves, and scarf (or scarves). Long underwear is perfect to wear under clothing every day. If you'll be visiting the cities, bring a down jacket, and maybe a wool overcoat. For winter sports activities, bring your insulated skiing gear. It's better to have a heavy suitcase than to be freezing in the cold for a week. But no matter what your destination is, an insulated coat, gloves, hats, and scarves are the bare minimum for travelers in January. Bundle up. The holiday season in Scandinavia doesn't officially end until January, which means there are plenty of events, festivals, and other attractions for travelers. New Year's Day (January 1): January 1 is New Year's Day. Expect many restaurants, shops, and tourist attractions to be closed. Epiphany (January 6): Commonly called Three Kings Day, Epiphany celebrates the three wise men's visit to baby Jesus. It's celebrated in Finland, Sweden, and Iceland. Hilarymas (St Knut's Day) (January 13): It's on this day that Christmas festivities officially come to a close. The occasion is typically marked with food and dancing. Thorrablot Midwinter Feast (the Friday after January 19): While Iceland is technically a Nordic country, not Scandinavian, the country still has many close ties with its truly Scandinavian neighbors. This Icelandic holiday was a sacrificial midwinter feast to Pagan gods in past years, but now locals use the day to get together and enjoy Icelandic culinary delicacies, like rotten shark’s meat (hákarl) or boiled sheep’s head (svið). The aurora borealis (Northern Lights) is best seen on the Arctic Circle in very clear and dark winter nights. They have been seen in southern Scandinavia sometimes, but it is very important that you are in a dark and clear night, away from the city. Some major attractions have shortened hours during January and other winter months, so it's always wise to double-check before visiting. If you plan on renting a car, confirm that the cost includes winter tires. These are compulsory in many countries from December through March and are not always included in the cost of the rental.